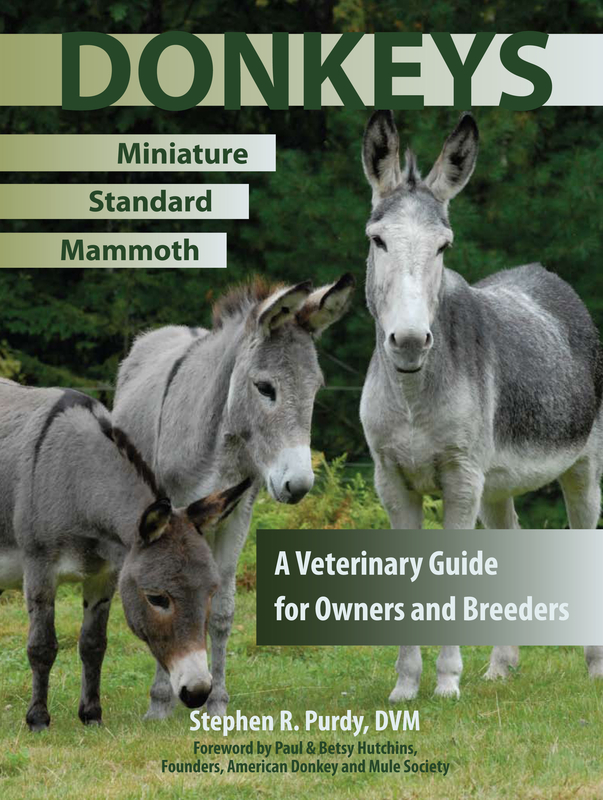 “Donkeys — Miniature, Standard, Mammoth: A Veterinary Guide for Owners and Breeders” by Stephen R. Purdy, DVM, comprises a health-care overhaul package forequinis asinus. This 160-page book, illustrated with full-color graphics and photographs, is a handy reference for donkey owners and also should be on the shelves of veterinarians who treat these animals. Some information, like drug doses and the use of radiography and ultrasounds, is clearly intended for veterinary use only. In my 30-year association with donkeys, I’ve noticed most vets apply horse medicine practices when treating these animals. However, while donkeys are equines, Purdy documents some genetic, anatomical and medical differences owners and veterinarians should consider. He also notes that donkeys may metabolize some drugs at different rates than horses. Purdy opens with terminology and an overview and history of donkeys in both the U.S. and the rest of the world. While noting that most donkeys in the United States are now pets, the author makes a point of the importance of donkeys to families and economies in Third World countries. Purdy states there are 90 million working donkeys (other estimates put the figure around 44 million) in non-industrialized countries. An entire chapter is devoted to the nutritional requirements of donkeys, which through evolution have developed a more efficient metabolism than horses. For this reason, idle donkeys generally tend to become overweight or obese when fed too much high-quality forages and feeds. A nice addition to future editions of this book would be a section about how to properly feed hardworking donkeys for performance. The author devotes considerable attention to herd health, parasites and diseases. One refreshing aspect is the recommendation that donkey owners use sound management practices, testing and selective deworming rather than wholesale treatment with anti-parasitics, which can lead to drug-resistant parasites. Purdy also details the digestive and musculoskeletal systems, and the differences in these between donkeys and horses. Nearly one-third of the book is devoted to reproduction, artificial insemination, pregnancy and foaling. While this information is very important for breeders and veterinarians, many donkey owners will find this material useful only as general interest or background information. One point of reproductive health that does affect a large number of donkey owners is castration. Intact male donkeys can be aggressive and unpredictable. Unless you intend to use your stud donkey in a breeding program, or have some other specific reason to keep him intact, it’s generally advisable to have him gelded. This book details the procedure. Moreover, Purdy notes something important about castration that I have learned with experience along with my veterinarians — it’s best for the veterinarian to ligate the vascular cord with a suture rather than using an emasculator, as is standard when castrating a horse. Donkeys have larger scrotal blood vessels than a horse and are more prone to excessive bleeding following castration. This point cannot be overstated, as I have had two donkeys bleed excessively following castration, and one friend actually lost a donkey due to blood loss after castration. This point about castration illustrates the value in this book as a donkey-specific resource for health and veterinary care. Dr. Purdy has given us something the donkey world has been lacking — a sound guide for owners and veterinarians in caring for these wonderful and in many cases, hardworking, animals. This entry was posted on November 21, 2010 at 2:26 pm and is filed under Burros. You can follow any responses to this entry through the RSS 2.0 feed. You can leave a response, or trackback from your own site. I read a book review about this book in Mules & More this weekend. Looks like a great resource. We received 2″ of snow form the “monster storm” in Leadville. Dave, did you notice who wrote that book review in Mules and More? A condo on the HARP (Homeless Anglers Recreation Project) might suit you. How do I order this book. We have a mini donkey and he was just gelded on Tuesday and I think this will be a great help!